Here’s a print awareness worksheet that does double duty! Kids learn that letters put together make words and ask how many letters are in those words? They cut out and glue the words in the correct categories. 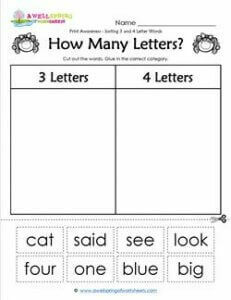 The words are: cat, said, see, look, four, one, blue, big.